I love this photo. Taken at Cornwall Park, Auckland, NZ, on our last trip home together in 2009. 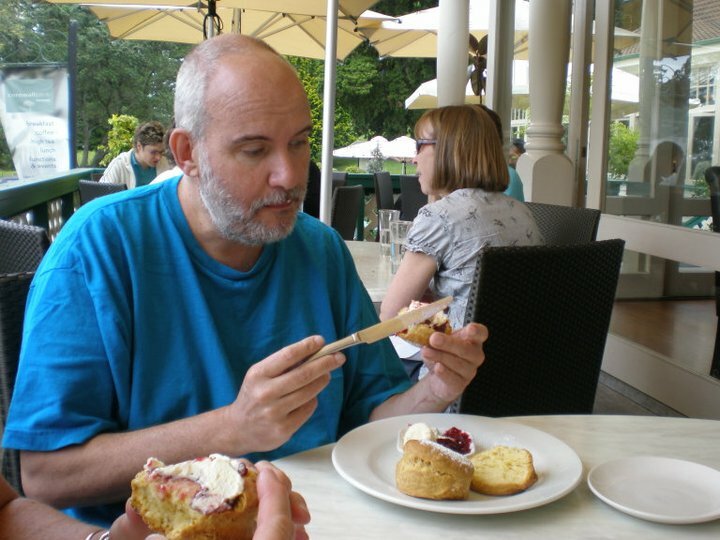 Here, Roger attempts partaking in a traditional Devonshire Cream Tea, in a manner appropriate for such an important tradition. Cut the scone in half, lather butter on both parts, smear fresh strawberry jam on top, and the piece de resistance–the clotted cream of course. Ideally, accompany with a perfectly brewed pot of Earl Grey tea. Those of you familiar with Devonshire Cream Tea may also appreciate the humor of Little Britain,especially the skit with Emily Howard and Florence being ladies. On this day, Roger was the perfect Emily Howard, to his brother-in-law, Graham’s, Florence. My sister and I performed far less daintily, and in fact had trouble executing the teapot. My Scottish nana would’ve been shamed, indeed. Nonetheless, this is one of my favorite memories of our life together, and one of the penultimate stops of our many road-trips. Just a few months before this picture was taken Roger hadn’t been doing at all well. His monthly scan had revealed a spread of tumors to his bones — neck, hips, breastbone. Radiation was extremely tricky, as a large tumor lay directly over his heart. But the pain he was experiencing made the choice of more radiation inevitable. And inevitably, the radiation made Roger deathly ill.
As always, his appetite plummeted. So did his weight. Months before this setback, we’d planned this trip to New Zealand — knowing that it would be Roger’s last. He loved my birth country and he loved my family. He wanted to say goodbye to both. Cancelling this trip just wasn’t an option. So, reluctantly, he began another course of high dosage steroids, the side effects unpleasant and unpredictable, but, in this instance, greatly beneficial. Almost immediately his appetite soared and as for our planned trip home to New Zealand….there couldn’t be a better place on earth for someone with a recovering appetite: freshly caught snapper, scallops, and crayfish, courteous of my brother and nephew; trees laden with exotic fruits; supermarkets overflowing with dairy products unrivalled by any place in the world. As for the ice-cream– Roger had met his match. By the time we left New Zealand, Roger was tanned, had gained considerable weight, and looked and felt healthier than he had in years. The exotic combination of steroids, location, and communion with loved ones had worked miracles for him, for us. Regardless of obstacles, when faced with a terminal illness you have to take chances. You learn to travel with wheelchairs, and oxygen tanks, and any other paraphernalia that’ll make the trip possible. As a care-giver, it can be exhausting; but at the end of the day, and at the end of your loved one’s life, you’ll have this amazing collection of memories…sand in your toes, that first taste of crayfish, a leftover dollop of cream on a shirt, and so much laughter. I was so happy that you guys did this. I will never forget how he actually looked almost totally healthy when you got back. I remember before he was sick he talked about relocating with you to NZ someday and opening a bar or restaurant or something… can’t remember which. He did love it there, and it’s such a wonderful thing that you were able to take him that one last time. Thanks, Hil. There are times when I sit back and let the screensaver of these pics take me back in time. Every photo holds so many feelings. This is such a poignant post, Nikki–beautifully written–painful and playful all at once–not an easy task for a writer. This sounds like a lovely and deeply meaningful trip for you both. Can’t wait to read your book! Thanks, Kathy, and it’s so wonderful to hear from you. I really appreciate your input– accomplished writer that you are! I am really enjoying your blog. Love that you both got to go N.Z.